The War Office in Naypyidaw has ordered Burmese government forces based in ethnic areas to relaunch their infamous “Four Cuts” strategy against the ethnic cease-fire groups that continue to resist the junta's Border Guard Force (BGF) plan. The Burmese army's “Four Cuts” policy was developed in the 1970s during the former regime of the Burmese Socialist Programme Party with the intention of undermining ethnic militias by cutting off access to food, funds, information and recruitment, often with devastating consequences. According to military sources, the War Office recently ordered regional commanders to reimpose the strategy in areas including Kachin State, Shan State, Karenni State , Karen State , Mon State and Tenasserim Division. Military sources said the renewed campaign would include an additional “cut”—a policy of severing communication routes between allied ethnic groups. Commenting on the information about the new “Four Cuts” campaign, Aung Kyaw Zaw, a Burmese military observer at the Sino-Burmese border who has close contacts to several ethnic armed groups, said the junta’s plan could be irrelevant because many ethnic armies are based in border areas. Some observers expressed concern about an escalation of human rights violations such as forced relocations, the burning of villages and summary executions in ethnic areas, atrocities that invariably accompany such a strategy, they said. Aung Lynn Htut, a former counter intelligence officer now living in the US, said the massive internal displacement in eastern Burma is directly related to the “Four Cuts” strategy, which was known in the far south of Burma as “No Man's Land” policy during operations in the 1990s, directly commanded by the office of the commander-in-chief. The “No Man's Land” policy was ordered by the War Office to execute anyone, including children, who were found in areas of military operations,” he said. 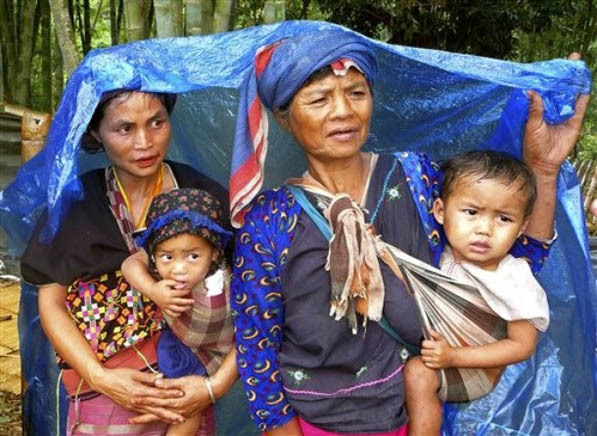 Since 1989, the military regime has signed cease-fire agreements with as many as 17 ethnic armed groups. However, the major cease-fire groups have rejected the BGF plan that was first raised in April 2009. Those groups include: the United Wa State Army; the Kachin Independent Organization; the National Democratic Alliance Army, also known as the Mongla group, the Myanmar National Democratic Alliance Army or the Kokang group, the New Mon State Party, and a faction of the Democratic Karen Buddhist Army. The War Office in Naypyidaw should cut their a)corruptions b)budget for purchasing computer war games and arms c)overseas trips for their medical treatments, shopping and military trainings d)building constructions for underground tunnels. Saw Dennis wrote: "Now they realize that the dictatorship just used the ceasefire to divide and weaken them...."
I doubt that if some of us really learnt the lessons at all. We have seen people keep falling into their traps, throughout the history of Burma. It's high time we all developed a genuine union spirit. One for all, and all for one! "stupid military government and miserable victims of this policy " . 'Four Cuts' campaign against the ethnic peoples? Actually, the 'Four Cuts' campaign against the ethnic peoples and forces, who have to carry on armed resistance has never been withdrawn by the military dictatorship. This new order from Naypyidaw is apparently a move to frighten the ceasefire groups, which are now preparing to resume active resistance for freedom.The ceasefire armies have sincerely tried to resolve the political problems by political means. Now they realize that the dictatorship just used the ceasefire to divide and weaken them, and there is only one way for them to gain their rights to equality and self-development. If there is 'No Pain, there can be No Gain.' Only total removal of the military dictatorship is the answer to all problems in Burma. The ethnic forces must do it by hook or by crook, to save the country from further destruction and degeneration. Four cuts Cut off the officers from the troops, cut the officers off from their businesses, cut the officers off from control cut off the officers heads. Remove their heads and their control will die along with them. Act now brothers, kill an officer today. Long live freedom for Burma!! Failing to for the federal Army will drag this country to the hell.